Director: Manolo CaroWriters: Paolo Genovese, Paola MamminiStars: Bruno Bichir, Manuel Garcia-Rulfo, Franky MartínSummary: From Mexican auteur Manolo Caro "THE HOUSE OF FLOWERS" comes PERFECT STRANGERS "PERFECTOS DESCONOCIDOS", a story about a seemingly simple dinner. 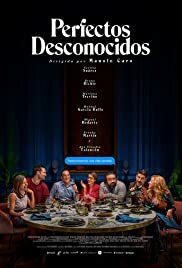 When a group of best friends get together during a lunar eclipse to share an intimate dinner in the tasteful house of Eva "Cecilia Suarez" and Antonio "Bruno Bichir", they suspect it's just another typical night until the hostess proposes a game. All guests must lay their cell phones on the table and read aloud all incoming messages and answer all incoming phone calls in front of the entire group. What begins as a provocative party game quickly becomes a wild ride full of twists and "textual tension" in this comedy about the secrets we all carry in our pockets.